The Lady Aurelia Swarovski necklace features the beauty and elegant look of a simplicity pattern by using Swarovski white pearls interspersed with crystal beads. This is an understated necklace, with its charm emanating from the sparkle of the crystals alternating with the bright white pearls. A perfect companion to the Countess Lydia Swarovski earrings or as a necklace to be worn on any occasion. 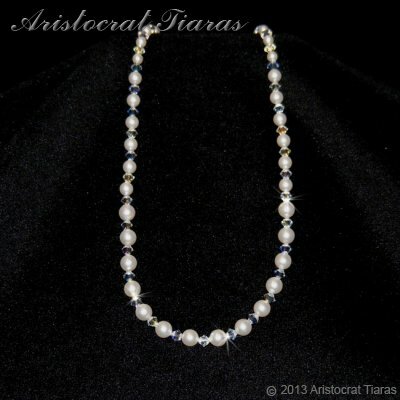 This handmade necklace from Aristocrat Tiaras is part of our bridal jewellery collection for brides designed to compliment our bridal tiaras such as PrincessAurora flower tiara.